Astronomers have found a large world of ice and rock circling the Sun beyond the most distant planet, Pluto. Preliminary observations suggest it may be up to 1,800km (1,120 miles) across, making it the largest body other than a true planet to be discovered orbiting the Sun. 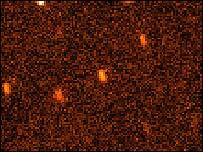 Designated 2004 DW, it was found on 17 February by an automated sky survey telescope in California. Since 1992 about 800 bodies have been found in the outer Solar System; five could be larger than 1,000km (620 miles) across. 2004 DW was found by California Institute of Technology astronomers Chad Trujillo and Mike Brown, and David Rabinowitz of Yale University, the same team that discovered Quaoar in 2002. With an estimated size of somewhere between 840km (520 miles) and 1,800km it may be larger that Quaoar, which is 1,000km and 1,400km (870 miles) across. If it is at the upper end of the uncertainty range then 2004 DW is larger than any other object found circling the Sun since Pluto was discovered in 1930 (Pluto is 2,300km across - 1,430 miles). 2004 DW could even be larger than Pluto's moon, Charon which is 1,300km (810 miles) across. It has an orbit that is much larger than Pluto's, being, on average, 2.4 billion km (1.5 billion miles) further out. The Kuiper Belt (KB) is a region inhabited by small worlds of rock and ice. It is similar in some ways to the Asteroid Belt - a region of rocky debris between Mars and Jupiter. However, the KB contains a hundred times more material than all the asteroids put together. One thing astronomers want to stress is that 2004 DW is not a major planet. Although it is probably slightly larger than half the size of Pluto, there are other objects of a similar size out there which do not, by the current definition, qualify as a planet. But that is not to say that a new planet could not be found. Experts say there could be a Pluto-sized object lurking in the darkness awaiting discovery. 2004 DW could be a type of object called a "Plutino." Such objects have an orbit related to Pluto's path around the Sun. Looking back in their archives astronomers have already picked up the new object in images taken in 2002. They will use this observation, and any others they may find further back, to determine its orbit more accurately.